That’s what was on the drawing board of whatever committee had boards to draw that kind of thing on back in the pre-anthropomorphic Auburn days of 1972. 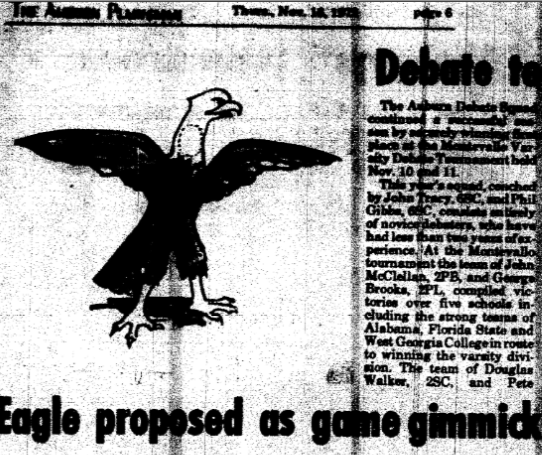 Indeed— until 1979, when our fabulous feline sprang from the then only recently discontinued Phil Neel drawn covers of Auburn Football Illustrated, the scope of AU mascotting was limited only to the real feather and blood no-that’s-our-battle-cry War Eagle and the first of the two Holloway kids who were allowed to roam the sidelines in tiger costumes(more on that later). But why an eagle instead of a tiger? LSU. “I feel that we have a distinctive name in ‘war eagles,’ and since there is already a ‘tigers’ in this conference, we might as well use this distinction”— and from the way the story reads, we came close to. The head of Auburn’s Spirit Committee was down with it. So was Dean Foy. *If I read the story right, there actually was a design delivered; we’ve updated our eBay alerts accordingly. ** How did I not know about this? If it’s true, then Auburn owns space harder than we ever imagined. Can you give us more info on the “Holloway kids” in tiger costumes? I remember going to AU basketball games in the 70’s and seeing a kid in a tiger costume out on the court with Aubie. Is that what you’re talking about? Kansas has the Jayhwak and Kansas State has Willie the Wildcat. Mattingly had one of the other astronauts take the flag to the surface, I believe. He was the Command Module Pilot, which means he was the one left alone and circling above the moon while the Commander and Lunar Module Pilot went to the surface. Still doesn’t change the fact that there’s an Auburn flag on the moon, though. One of the Holloway kids you mention in your article is my boss! Love that I found this–can’t wait to share it with him!! I think we mentioned in a previous Wishbone column and in our Season of Our Dreams book that Coach Jordan originally wanted to put a War Eagle eagle head on the sides of Auburn’s helmets, back when they were just plain white. Instead, good ol’ Jeff Beard went and found some stencils and created the distinctive interlocking AU. Jordan approved. Thank you again, JB.